Thanks to years of public education and organizing around the globe, the once-obscure investor-state dispute settlement (ISDS) system is on the ropes. The ISDS system, buried in trade and investment agreements, grants new rights to multinational corporations to sue governments before a panel of three corporate lawyers. These lawyers can award the corporations unlimited sums to be paid by taxpayers, including for the loss of expected future profits, and their decisions are not subject to appeal. The corporations need only convince the lawyers that an environmental law or safety regulation violates the expansive investor profits granted by such pacts. As governments are increasingly questioning the legitimacy of this system, the law firms and corporate beneficiaries of the regime are trying defend it, including by rigging international intergovernmental meetings like the one I recently managed to attend despite being banned. Supporters of the ISDS regime are on the defensive for good reason. The Trans-Pacific Partnership (TPP) never achieved majority support in the US Congress in large part due to bipartisan opposition to ISDS — from the Republican-majority National Conference on State Legislatures and US Supreme Court Chief Justice John Roberts, to Nobel laureate economist Joseph Stiglitz and Sen. Elizabeth Warren. 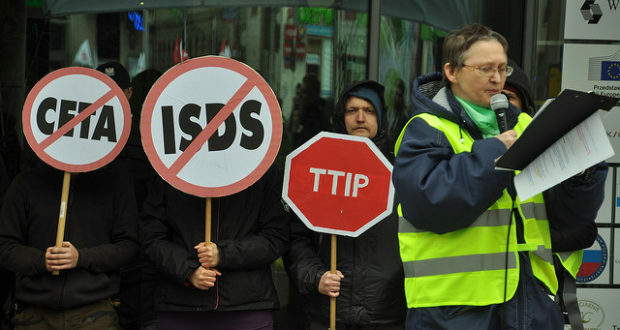 The EU Trade Commissioner admitted that ISDS was "the most toxic acronym in Europe." As the number of ISDS cases filed each year has exploded and corporations have won billions in attacks on a stunning array of policies, governments from South Africa to Indonesia to Ecuador have terminated many of their treaties that include ISDS. Even the Trump administration has proposed eliminating ISDS from the North American Free Trade Agreement (NAFTA). The law firms, tribunalists, hedge funds and private equity firms getting rich off of these raids on governments’ treasuries have been scrambling to figure out how they can save the system, even as they are being forced to reckon with massive opposition to ISDS by civil society and governments alike. The result has been a high-stakes shell game, with ISDS defenders setting up discussions about whether the system requires "reforms" that are designed to avoid real change. Exhibit A: The little-known United Nations Commission on International Trade Law (UNCITRAL), which provides one set of rules under which many ISDS cases are litigated, has now been forced to engage in a discussion about the need to reform ISDS. Very few people — even within governments — have paid much attention to UNCITRAL. But the arbitration industry, and all the law firms who make millions bringing ISDS cases on behalf of corporations or sitting as arbitrators in these ad hoc tribunals, have been heavily invested in this process. Whose views is UNCITRAL most interested in hearing, as the agency holds a series of meetings to discuss whether ISDS reform is desirable and what those reforms should be? The report from the first November 2017 UNCITRAL ISDS "reform" meeting made that quite clear: Of the 27 groups listed as non-governmental "observers," all but two (93 percent) represented the arbitration industry. If this were not sufficiently galling, many of the governments’ own delegations to the meeting included private ISDS lawyers and arbitrators. Indeed, some governments, including Mauritius, Iceland and Bahrain, were solely represented by practicing arbitrators. The arbitration industry is obviously not keen for UNCITRAL to engage in meaningful reform of the system. Those who wish to save the ISDS regime are aiming to hijack the UNCITRAL reform discussion to maintain the status quo or promote half-measures around the margins that do not address ISDS’s fundamental flaws. For instance, the European Union has been pushing a proposal to establish a "multilateral investment court" within this process, which could actually institutionalize and formalize the ISDS system. Concerned about this danger, Public Citizen’s Global Trade Watch, along with other international civil society organizations, applied to be observers at the April 2018 meeting in order to provide more critical views of some of the emerging proposals. UNCITRAL’s observer application process is opaque and unclear, but we sent a detailed letter explaining how we met their observer criteria relating to international focus, competence and expertise in the subject area, and whether we would contribute to reaching the goal of a more balanced representation of major viewpoints. We fully expected to be approved as observers, given our deep expertise in the issue and that we have been accredited to attend all the World Trade Organization ministerial meetings and other UN meetings on ISDS. But Public Citizen and other close allies received rejection letters from UNCITRAL. The message seemed pretty clear: UNCITRAL welcomes the arbitration industry to be a part of these discussions, despite the clear conflict of interest. But several civil society organizations like ours that represent the public interest were to be kept away. Despite being officially banned from the premises, yours truly managed to attend the April 2018 UNCITRAL meeting in New York as a guest of an approved organization. The flawed, biased process became even more evident. The arbitration industry dominated observer and governmental delegations in the actual formal sessions. Thirty-seven of the 44 nongovernmental observer organizations represented private lawyers and arbitrators, while only seven represented broader civil society interests. Hardly "reaching the goal of a more balanced representation of major viewpoints" that was the remit of the UNCITRAL secretariat. An "academic forum" — held on the sidelines of the UNCITRAL meeting — was organized by a well-known arbitrator who served as an official member of Switzerland’s delegation to the meeting. Many academics who participated in the forum were also arbitrators themselves with a personal financial stake in the ISDS system. Not only were well-known academic critics of the system notably absent from the invitation list, but the event itself was held at the New York International Arbitration Centre — not exactly a neutral, academic venue. The UNCITRAL secretariat did not have its story straight about the role of this academic forum or a separately organized "practitioners’ forum," which even more explicitly represented the views of the arbitrators. During an introductory meeting with civil society organizations, the UNCITRAL representative explained that the practitioners’ forum and the academics’ forum were separate from the UNCITRAL proceedings. The official said that results of those discussions would only be linked to the UNCITRAL website if they meet a "test" of "objective, neutral and fact-based, technical and not political, and from research and not political organizations." It is peculiar that the views of people with a personal financial stake in maintaining the ISDS status quo as arbitrators might be considered "neutral" and "not political" in a discussion about reforming the ISDS system. It only got more bizarre. During the UNCITRAL meeting, an official US government delegation representative took the floor and invited all the government delegates to an evening event hosted by his law firm, King and Spalding. The firm has represented corporations in some of the most egregious ISDS claims, including the infamous Chevron v. Ecuador case. No one in the room seemed to question the propriety of a private law firm that earns millions from the ISDS system speaking on behalf of the US government delegation to invite delegates at an intergovernmental meeting to that law firm’s event. At that King and Spalding event, the UNCITRAL secretariat announced that because they "wanted to ensure the widest possible input, [UNCITRAL] set up the practitioners’ forum and the academic forum," and they specifically wanted "to hear from arbitrators because they are the people most affected by the UNCITRAL process." Yes, those would be the same forums that UNCITRAL officials said were unrelated to the meeting. And of course, no mention of the communities around the globe who are affected by ISDS attacks against their environmental, public health and safety laws. Further, while civil society organizations were informed by UNCITRAL that no space was available inside the UN building for side events, the International Chamber of Commerce held just such a side event down the hall from the official meetings in the UN building. Perhaps perceiving the public relations nightmare that might arise from their biased meeting, toward the end of the week, some governments and the UNCITRAL secretariat took some small steps to include the perspectives of the few civil society organizations present. But the takeaway from the UNCITRAL’s process for its so-called "reform" discussions thus far is that lawyers making millions in ISDS cases are welcomed, while the voices of the millions of people whose lives are harmed by ISDS cases brought by multinational corporations are barely an afterthought. Venues like UNCITRAL and the arbitration industry may want to tamp down the wave of opposition to the unjust ISDS system, even as they go through the motions of considering "reform." But sidelining the growing critique against ISDS from across the political spectrum around the globe will most certainly backfire. Worldwide, the call to end ISDS is only growing louder, and pro-status quo forces ignore those voices at their peril. Melinda St. Louis is International Campaigns Director with Public Citizen’s Global Trade Watch, where she works with international allies to roll-back WTO financial deregulation and to stop expansion of harmful trade agreements.